Bring Ghostbusters with you where ever you are going thanks to this neon Ghostbusters logo t-shirt. The black Ghostbusters t-shirt shows the famous logo as used by the Ghostbusters on but this time it looks different because it is made in a neon color almost like a neon light. Unfortunately the t-shirt does not light up but it still looks amazing. You can get your Ghostbusters t-shirt in men’s sizes Small – 6XL and it made from preshrunk cotton. So start scaring away the ghosts by wearing this cool Ghostbusters t-shirt around town where ever you go because we have to get those ghost moving out of town. 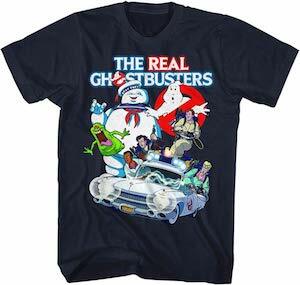 If you like a fun Ghostbusters shirt then check out this The Real Ghostbusters t-shirt. You can get this t-shirt in sizes Small – 5XL and it is navy blue and made from 100% cotton. On the shirt you can see the Ghostbusters logo and above it the text “The Real Ghostbusters” and below all that the main characters of this classic cartoon based on the Ghostbusters movie. It is a great t-shirt for anyone that love the Ghostbusters and not just the movies as the cartoon is what this t-shirt is all about and that really looks amazing. Now there is a Ghostbusters logo baby bodysuit that will protect your child from ghost. The 100% cotton snapsuit is available in sizes 6 – 24 months and is white in color with on it in red the famous Ghostbusters logo and the red seems to be dripping a bit as if it was freshly painted on the baby clothes. So your baby can be protected from Slimer while looking adorable as a little Ghostbusters and that is way cooler then just a plain and boring bodysuit like most babies wear. No need to wait any longer because we know that what your child is wearing now will be dirty in not time at all making this a great replacement. 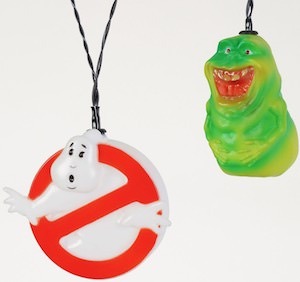 Now you can bring light to the dark with these Ghostbusters string lights. The string lights are a string with two different lights on it and those lights are the famous Ghostbusters logo and Slimer the famous green slime we all know. The Ghostbusters string lights are battery operated so they will work anywhere. On the string you will find 10 lights and it will be great as part fo your Halloween decorations or just as room decor and maybe even as Christmas lights if you like to have a Ghostbusters tree. 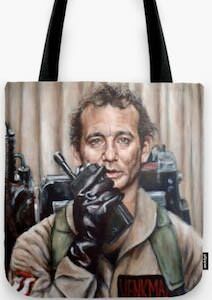 Make it clear to the dark that your like the Ghostbusters. 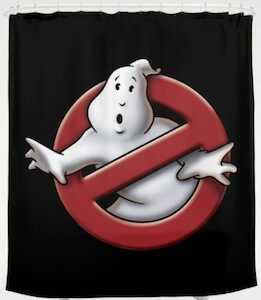 If you have ghosts in your bathroom then maybe this Ghostbusters shower curtain will scare them away. This Ghostbusters shower curtain is everything a true fan needs in their bathroom. The curtain is black and measures 71 x 74 inches and on the black you can find a giant Ghostbusters logo and that of course will prevent ghosts showering in your shower. A cool shower curtain is something you like to keep looking amazing and you can put it in the washing machine too so that the ghost in the logo will keep looking white and fresh. Now there is a women’s Ghostbusters sweater that is a must have. 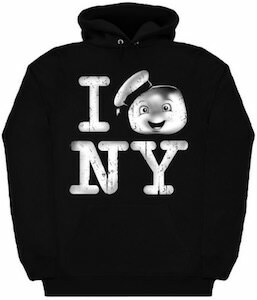 The black Ghostbusters sweatshirt shows the famous Ghostbusters logo on the front with blow it in red letters “Ghostbusters” and below that in white the famous punch line “Who you gonna call?”. You can get his fun shirt in women’s junior sizes Small – XL and they are made from 60% cotton and 40% polyester. 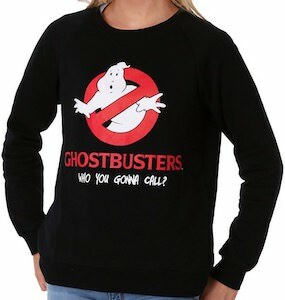 An officially licensed sweater like this is a must have to all the true fans of Ghostbusters and yes that does include the classic movie and the ladies Ghostbusters movie as they are all fun to watch. If you want a nice slimy creature to be part of your Halloween decorations then you should check out this hanging Slimer Halloween decoration. 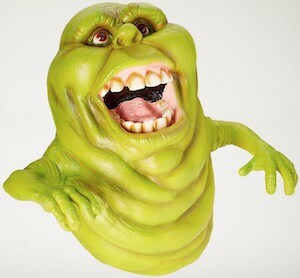 Ghostbusters fans all know Slimer and now there is a 17 inches tall character that you can hang somewhere in or around your home. And if you hang Slimer it is kinda freaky and perfect for Halloween as he is easy to hang somewhere. Now you just need someone in a Ghostbusters costume coming for trick or treat then they will love Slimer too. Sure you can have an outdoor inflatable that looks great but something as fun as this Ghostbusters creature is different and special.